My husband, Fred, suffered from Acid Reflux for several years. It was seriously horrible a couple of times. One time in particular we were vacationing in Michigan with family. It was our last day of vacation and we were suppose to be heading home. Instead, we headed for the ER. Fred was having severe pain. The 'cocktail' they whipped up for him in the ER didn't even make a dent. We were there for about 4 hours before they had finally given him enough meds to make the pain tolerable. We ended up staying in Holland an extra night before he could drive back to Illinois. Even with the prescription, Fred still would have issues from time to time. (shocking, I know) He's never been big on taking any medication, even Tylenol. So, he began researching acid reflux in hopes of finding some sort of natural remedy. This is when he came across Apple Cider Vinegar. There was tons of info on the web talking about how Apple Cider Vinegar could help and even cure acid reflux. Fred went out and bought some Bragg's Apple Cider Vinegar. He took the Bragg's the next time he had a major flare up and experienced immediate relief. He started taking a teaspoon mixed with water 3 times a day. After a while he noticed that he wasn't having any symptoms from the acid reflux. He stopped taking his prescription and kept taking the Bragg's. A few years later, he stopped taking the Bragg's except maybe once a month or so when he felt like the acid reflux was starting up again. Then he stopped taking it all together and had zero issues for a year. At the beginning of this year, when we decided to make some big changes to our lives regarding health, Fred decided we should both start taking the Bragg's every day. 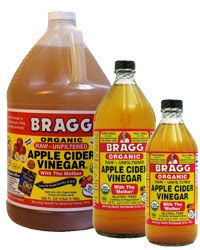 In addition to helping digestive issues, Bragg's Organic Apple Cider Vinegar boasts several other benefits as well. Helps Control Weight - Um, yes please! We both take a teaspoon with water once a day. Is it delicious? Not so much. Is it awful? No, just not real tasty. I've actually gotten use to the taste and just shoot it back. (I've done shots that tasted much worse) You can add a little honey as well to make it taste better. You can find Bragg's Organic Apple Cider Vinegar in most grocery stores and online at their website. Tell us your experience with it! I always had in mind that ACV had tons of benefits but I did not know that apple cider vinegar for acid reflux remedy was included. Now I do not have to endure anymore gross refluxes.